Canadore College Satisfaction Above Average - SchoolFinder.com! Canadore is above the provincial average in six areas according to recent KPI results. Canadore College is above the provincial college system’s average in six performance indicators according to the provincial Key Performance Indicator (KPI) survey results. Overall, Canadore exceeds the provincial average in student, graduate and employer satisfaction. Compared to other publicly-assisted colleges across Ontario, Canadore’s students feel more confident that their program is giving them the knowledge and skills they need to be useful in their future career, are more assured by the overall quality of the learning experiences in their program and express greater satisfaction in the overall quality of the services at the college. Ontario’s colleges offer 900 programs that prepare students for success in all sectors, including careers in aerospace, business, health care, tourism and hospitality, advertising, engineering, technology and advanced manufacturing. More than 240,000 full-time students and about 300,000 part-time students are enrolled in Ontario’s college programs, including record numbers of international students. Ontario college programs continue to be closely aligned with changing labour market demands in communities. Colleges work closely with business and industry leaders to ensure programs respond to shifts in local employers’ needs. The provincial government and the colleges have been gathering the annual data on college results since 1998. The most recent KPIs were gathered by two independent research firms in the period from March 2017 to February 2018. Canadore College trains people through applied learning, leadership and innovation. It provides access to over 75 full-time quality programs and has outstanding faculty and provides success services to students from nearly 400 Canadian communities and 15 international countries. The College and its students add nearly $244 million to Nipissing Parry Sound Service Area economy. 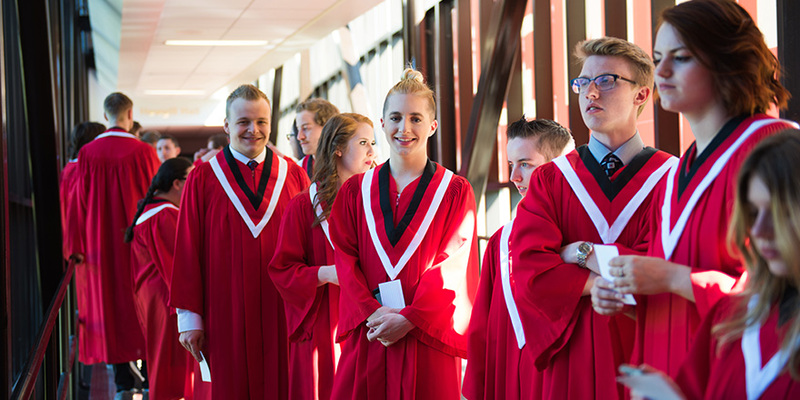 Approximately 1,000 students graduate from Canadore each year, and they join 45,000 alumni working across the globe. Canadore receives less than 50 per cent of its traditional funding from the provincial Ministry of Training, Colleges and Universities and relies on its own innovation and entrepreneurial endeavors and generous donors for the balance.